Aran islanders are getting the opportunity to skip age of petrol fumes. This week got their first glimpse of the electric car that could pave the way for a total transformation of life as they know it. The first Mega 'e-City' three-door hatchback arrived on Inis Mór on Tuesday for residents to test drive. One of their most pressing questions for the accompanying boffins was if this brainchild of French engineers could conquer the island's notoriously steep hills without the benefit of petrol or diesel. One thing they know already is that if the car hits its top speed of 64kph they will almost certainly escape the wrath of the law - the speed limit across the three islands is just 60kph. The electric car, which is about the same size as a Nissan Micra, is one of ten to be rolled out across the three islands as part of a three-year pilot project to see if the wind and ocean can generate enough energy for electricity, heat and transport for a small community. 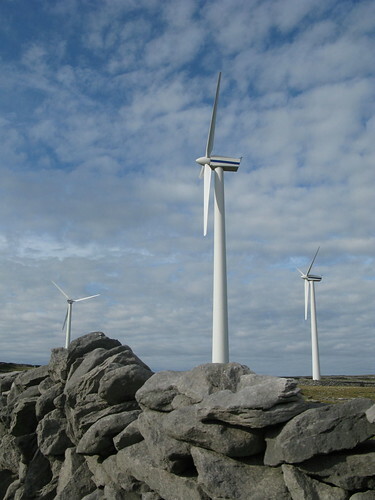 The project, which is a collaboration between Sustainable Energy Ireland (SEI) and the Department of Community, Rural and Gaeltacht Affairs, attracted tenders from 18 companies from around Europe. From January there will be six cars leased to residents of Inis Mór, two to Inis Meain and two to Inis Oirr, with different households chosen for each year of the project. Interested motorists must apply to the local co-op, Comharchumann Forbartha Árann Teo, to be accepted, but they must have a clean licence and driving history, they must be under 65 and currently drive a fully taxed vehicle. According to Fiona Smith of (SEI), successful applicants will have to pay a nominal amount for the lease of the car, around €12, a fee for a connection charge point on the outside of their home, which will be around €330, and then the cost of the electricity to run it. That is likely to be no more than €60 for the year. The electric car consumes 130 units per km, whereas a similarly sized car such as a Peugeot 107 consumes 520 units per km. Motorists are tipped to save up to 80% in fuel costs. "It really is a much, much more efficient alternative," explained Ms Smith. "This could become an alternative to shipping in fuel, making the island more self reliant and sustainable." Dara O'Maoildhia, secretary of the energy community on Inis Mór, said his first impressions of the first bright orange 'e-City' were extremely positive. "It's roomy in the front, there's no sense you're up against the window. But in the back I would say there's room only for two children. It's got electric windows, reversing sensors, it's comfortable enough. I've no doubt people will be interested in it," he told the Connacht Tribune. Queries put to the engineers by residents during their day-long visit to the island included how long the car would run before it needed charging, how long it would take for a car to be fixed and how many charging devices were necessary on the island. These are all issues likely to be ironed out before the launch in early January. The energy committees on the three islands have been pushing for more energy efficient alternatives for some years. Inis Mór now boasts an electric post van, while tourists can now rent electric bikes to explore the island. "Our vision for the island is to have no requirement for carbon fuel of any kind, no need for coal, petrol or diesel so that homes are heated and cars are run on alternative energy. We pay more for coal and more for a gallon of diesel than anywhere in the country - at the moment diesel is €1.06, whereas on the island it's €1.20," said Mr O'Maoildhia. He hopes smart meters will be installed in participating houses within the next three years, which will be attached to the side of the fuse box to monitor the electricity going in and out. Windmills may be built in the gardens and any energy generated will be directed by this smart box into the house to be used in the most efficient way. "The smart meter will direct the electricity to the battery of the car when the price of electricity is low, but when the price is high, it will be dropped into the electricity grid and you can make a fortune. "At least that's the plan," he said.